This was originally going to be a post on one of Nubar's duochromes, Moon Shadow. And it still is...kind of. But mostly it's now a warning on what not to do with your nail polish! 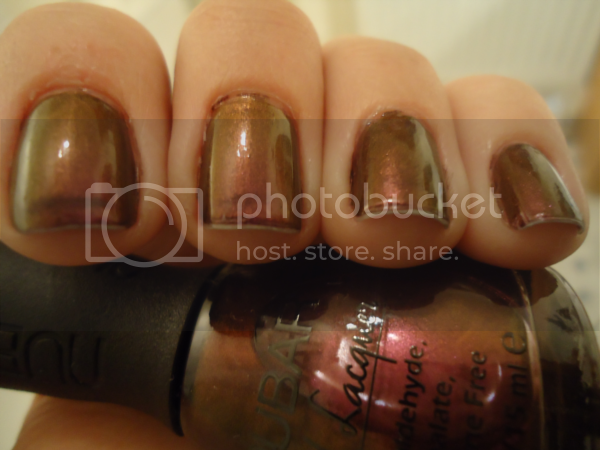 There is some confusion about the name of this Nubar duochrome. Originally called Moon Shadow, it's now listed on Nubar's website as Moon Eclipse, and on Beauty Bay as Moon Shadow Eclipse. I've done some Googling and it's definitely the same polish, just retitled. As for the colour, it's a rich purple duochrome that flashes bronze, gold, and even a little green. It's really pretty. 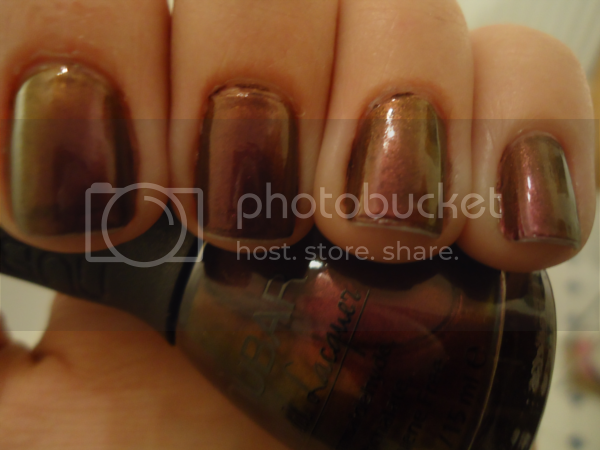 I found it a little sheer, however, so I used three coats on my nails. I then did a coat of Seche Vite to seal it...and herein lies my problem. See what looks like major tipwear? That's actually where the Seche Vite made my manicure shrink. I took these photos about an hour after applying Nubar Moon Shadow, and already it looks like I've been wearing it for days. Not cool. The good news is that I figured out why this happened, so I can prevent it from happening again and impart my wisdom to others. Normally when I apply a top coat I wrap it under the tip of my nails, as it seems to make my manicure last longer. It also appears to prevent the Seche Vite from shrinking, presumably because it means the Seche Vite has nowhere to actually shrink back from. For some reason I didn't do that this time, hence the craptacular manicure. To see better photographs of Nubar Moon Shadow/Eclipse go here, and for more information on how to get the best out of Seche Vite, go here.